We love long trips, but we also know that there isn’t always enough time to hit the open road and enjoy the freedom of travelling for days. That’s why we’ve created this great list of top day trips to some of our favourite watering holes near Perth. Jump in the car, make sure you’ve got everything you need and then get driving. All you’ll want to bring is a great playlist, lunch and good company! This delightful locale is one of the best-loved watering holes in WA. This isn’t just because it’s idyllic year round, but also because it’s only an hour from Perth’s CBD and offers lots of activities for young families, couples and solo travellers. There are plenty of wild flowers and a 3.5km walking trail which adjourns a reserve for native animals. If you’re not in the mood to tackle anything too big on your day trip, the falls are visible from the car park over a small footbridge. The spot is also accessible from a wet and dry weather route, meaning that the site is safe for drivers in most circumstances. The Gidgegannup picnic ground has ample parking and covers a large area about 800 metres long with play equipment, electric BBQs and toilets. 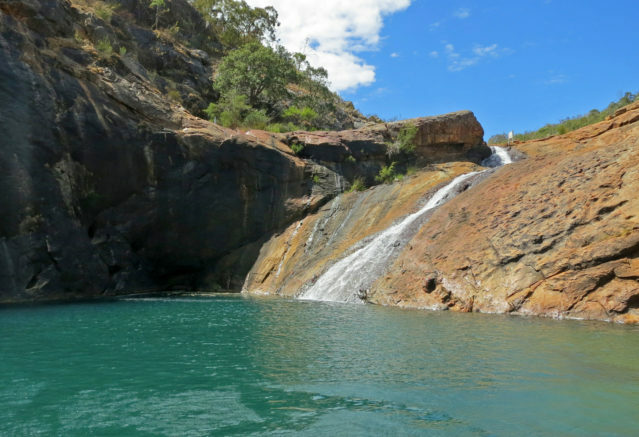 Just 45 minutes outside of Perth sit some of the best natural cascades to explore with your family. The light sheets of water are relatively safe for supervised young children to get up close with nature and explore the surroundings. The Stinton Cascades Nature Reserve is located in Karragullen, consisting of three reserves. There is a small hidden track that will take you into the cascades, but it can be difficult to locate. Drive along Brookton Highway and then turn right onto Gardiner Road and look for the track with a white barrier gate. One of the best features of this beautiful adventure is the wonderful sounds that the cascades make themselves, and the sounds that come from all of the rich native fauna that call this place home. A bit further out, two hours south of Perth, Honeymoon Pool is perfect for a romantic escape for a day. As per the signage, the pool is named as such as it’s where soldiers were once known to take their sweethearts to escape the stress of wartime life. As you’d expect, the area is beautifully serene with plenty of trees lining the Collie river to offer up shade. There’s a small campsite around which is great for families and even a small length of rapids under the bridge, suitable for body boards or kayaks. Close by you’ll find the Breenan track – a 4×4 only track with hill climbs and great views. This is a fantastic trip for families who would like a change from the typical beach setting. Serpentine falls offers a great setting for kids to have fun whilst staying active in the sand and stinger free ‘Serpy Falls’. Make sure you steer clear of climbing onto or jumping from the rock ledges as they are often very slippery and angle outwards, meaning the distance from peak to drop can be quite far. There are a few BBQ areas dotted around the site, but a packed lunch may suit this locale better. Parking is from $11 and there should be plenty of spots available. Do you have any other great watering holes to add to our list?